Miss Sales originally wrote about the Bling Ring kids in her March 2010 Vanity Fair article, “The Suspects Wore Louboutins.” She is an East Coast journalist who often writes about yet maintains her objective distance from “the celebrity industrial complex.” Filmmaker Sofia Coppola optioned Sales’s story, and her film adaptation opens tomorrow, June 14, 2013. I have no doubt many audience members, both teens and adults, will want to see the film because they wish to see beautiful actors wearing gorgeous clothes getting into all sorts of mischief. Doesn’t that sound like fun? These were good-looking, fashion-savvy kids who, in the words of one young woman’s attorney, went on a sort of “shopping spree.” But this IS a true crime story which Miss Sales delivers without irony. The interviews and exchanges with the Bling Ring kids proves, yet again, that truth is stranger than fiction. TBR carried out their burglaries by being equally naïve and extremely devious. They had detailed surveillance on their targets with the tools of their generation: Google Earth, Twitter, and TMZ. TBR robbed the residences of Paris Hilton, Lindsay Lohan, Orlando Bloom, Rachel Bilson, Brian Austin Green, and Audrina Partridge. Sales interviewed the Bling Ring kids, and has captured each one’s narcissism and “wannabe” sense of entitlement from growing up near the rich and famous. Parts of the evidence against TBR were photos they posted of themselves wearing stolen items on their own Facebook pages. These “celebrities” are, in fact, actual human beings who became victims of terribly invasive crimes. And these “kids” are, in fact, actually criminals. Nancy Jo Sales writes with stylish, crisp and keenly intelligent prose. There’s a sassy turn of phrase here, a nod to Raymond Chandler there. I particularly like Miss Sales’s L.A. cop connection “Vince.” Smart investigator that he is, he knows why TBR did what they did. They did it for the money! She employs history, economics, politics, sociology, and psychology while deftly moving the story along. Her examination of what compelled and allowed these “girls and boys” to commit these crimes is provocative and profound. This book would not have been half so pleasurable without Miss Sales’s dissection and analysis of how and why our 21st century society has become so obsessed with celebrity, wealth and fame. 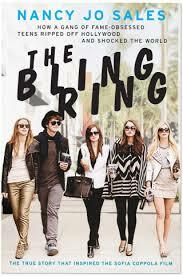 THE BLING RING by Nancy Jo Sales is the thinking person’s summer read. Excellent blog. I am not sure what to expect but it sounds interesting. I'd like to read the book, wait for the video later. I love the title and concept.